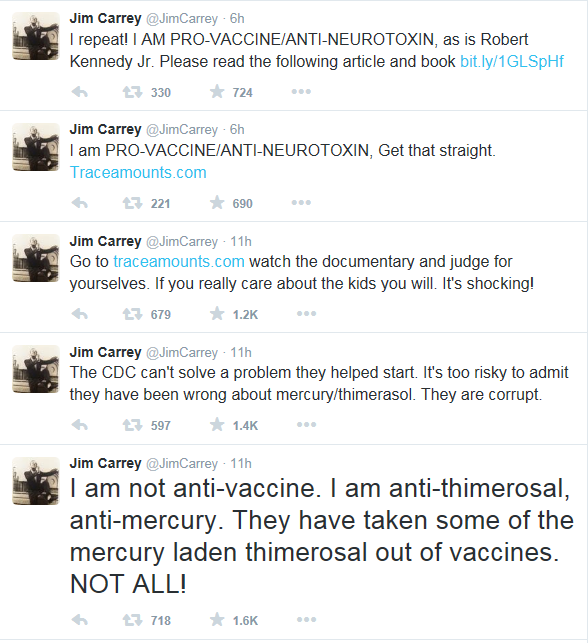 Comedian and actor Jim Carrey is apparently taking flak for his position on the regulation of vaccines. It got so bad that he went on to clarify his position on Twitter. The controversy apparently stems from Carrey’s objection to the use of thimerosal, a mercury-based preservative and anti-septic that fellow vaccination proponent Robert Kennedy, Jr. says is potentially dangerous and a leading cause of autism spectrum disorder increases since 2003. Defenders of thimerosal insist it’s safe and that concerns about its potential for causing neurological disorders are overblown. The World Health Organization seems to concur with the defenders. My own take on this is that yes, the public should know if the vaccines given to our children are safe or not, so they can make informed choices regarding the health and safety of their kids. That is what Jim Carrey is arguing. He is not arguing against the use of vaccines, but a component thereof that may cause autism (although scientific data doesn’t seem to support that particular argument). It’s one thing to call those who refuse to have their children vaccinated at all reckless and irresponsible. It’s quite another to do that to someone who has no objections to vaccination generally and is only concerned about a particular component within those vaccines. Yes, we should look at all available data (and demand that all data be made public) so we can render good judgment on the products we are asked to consume. And we should condemn those who dismiss science out of hand in order to cling to unreasoning beliefs that jeopardize human health and safety. But let’s not get so carried away with our devotion to reason and rational thinking that we become closed-minded ourselves. 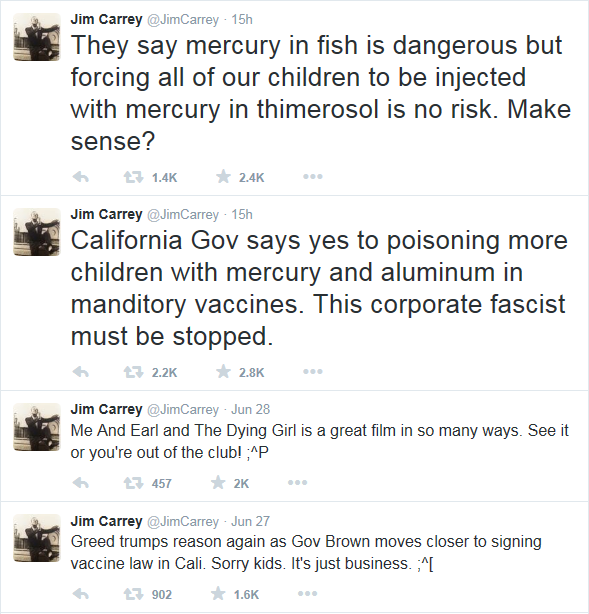 Jim Carrey could be wrong in thinking what he does about thimerosal; that doesn’t mean we should lump him in with irresponsible people who condemn all vaccines and refuse to let their children be immunized against diseases.